Coding Relic: Go Go Gadget Google Currents! 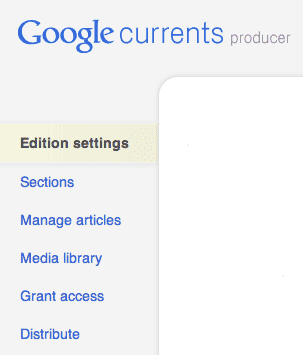 Last week Google introduced Currents, a publishing and distribution platform for smartphones and tablets. I decided to publish this blog as an edition, and wanted to walk through how it works. Edition settings: Entered the name for the blog, and the Google Analytics ID used on the web page. Sections: added a "Blog" section, sourced from the RSS feed for this blog. I use Feedburner to post-process the raw RSS feed coming from Blogger. However I saw no difference in the layout of the articles in Google Currents between Feedburner and the Blogger feed. As Currents provides statistics using Google Analytics, I didn't want to have double counting by having the same users show up in the Feedburner analytics. I went with the RSS feed from Blogger. Manage Articles: I didn't do anything special here. Once the system has fetched content from RSS it is possible to tweak its presentation here, but I doubt I will do that. There is a limit to the amount of time I'll spend futzing. Media Library: I uploaded the header graphic to use in the Sections tab. Grant access: anyone can read this blog. Distribute: I had to click to verify content ownership. As I had already gone through the verification process for Google Webmaster Tools, the Producer verification went through without additional effort. I then clicked "Distribute" and voila! Much of the publisher interface concerns formatting and presentation of articles. RSS feeds generally require significant work on the formatting to look reasonable, a service performed by Feedburner and by tools like Flipboard and Google Currents. Nonetheless, I don't think the formatting is the main point, presentation is a means to an end. RSS is a reasonable transport protocol, but people have pressed it into service as the supplier of presentation and layout as well by wrapping a UI around it. Its not very good at it. Publishing tools have to expend effort on presentation and layout to make it useable. Nonetheless, for me at least, the main point of publishing to Google Currents is discoverability. I'm hopeful it will evolve into a service which doesn't just show me material I already know I'm interested in, but also becomes good at suggesting new material which fits my interests. A concern has been expressed that content distribution tools like this, which use web protocols but are not a web page, will kill off the blog comments which motivate many smaller sites to continue publishing. 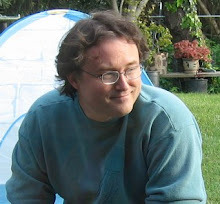 The thing is, in my experience at least, blog comments all but died long ago. Presentation of the content had nothing to do with it: Community trumps Content. That is, people motivated to leave comments tend to gravitate to an online community where they can interact. They don't confine themselves to material from a single site. Only the most massive blogs have the gravitational attraction to hold a community together. The rest quickly lose their atmosphere to Reddit/Facebook/Google+/etc. I am grateful when people leave comments on the blog, but I get just as much edification from a comment on a social site, and just as much consternation if the sentiment is negative, as if it is here. It is somewhat more difficult for me to find comments left on social sites, but let me be perfectly clear: that is my problem, and my job to stay on top of. 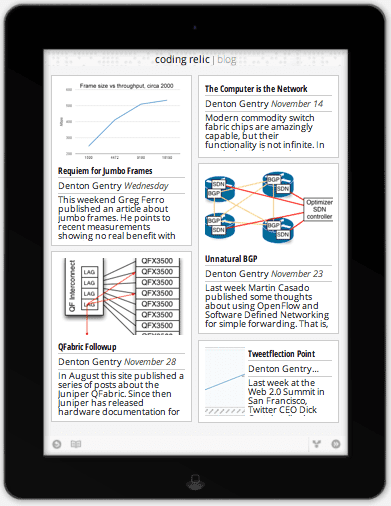 One other finding from setting up Currents: the Blogger mobile templates are quite good. The formatting of this site in a mobile browser is very nice, and similar to the formatting which Currents comes up with. To me Currents is mostly about discoverability, not just presentation.